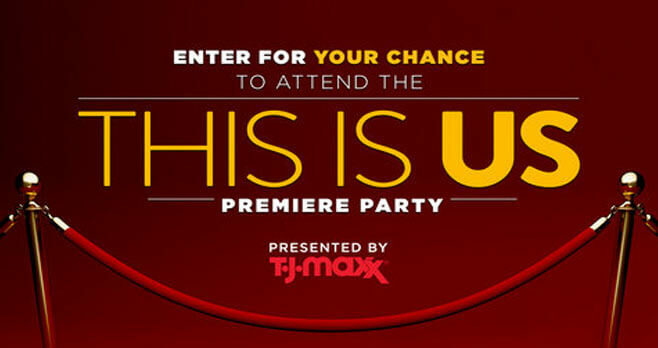 Enter the NBC This Is Us Sweepstakes presented by T.J. Maxx by registering online at www.nbc.com/tjmaxx daily through September 6, 2018 for a chance to attend the This Is Us Season 3 Premiere Party in Los Angeles, CA on September 25, 2018. Eligibility: The This Is Us Sweepstakes is open only to permanent, legal United States residents who are physically residing in one of the 48 continental United States, Hawaii, Puerto Rico or the District of Columbia (excluding Alaska, Guam, the Virgin Islands and other United States territories), and who are 21 years of age or older as of the start of the Sweepstakes Period. Promotion Period: The Sweepstakes begins on August 6, 2018 at 10:00 AM PT and ends on September 6, 2018 at 10:00 AM PT. Limit: You may enter once per day during the Sweepstakes Period. Prize(s): The grand prize consists of a 3 day, 2 night trip for two to the This is Us premiere party scheduled to take place in Los Angeles, CA on September 25, 2018.